Red Sunset Maple Tree For Sale - Low Prices Online now! Red Sunset Maple provides visual interest during any season; this highly ornamental deciduous tree is favored by landscapers. The stunning red sunset maple tree is aptly named since everything from its buds to leaves to stem to winged seeds has a red hue. Its good branch structure and rapid growth rate make this beauty perfect for enhancing your landscape. Hardy in Zones 4-8, this showy deciduous tree may grow two feet or more per year, and can reach a height of 50 feet. This maple grows well in acidic, humus-rich, moist, well-drained soil in partial shade or full sun. Curb appeal abounds with the Red Sunset Maple outstanding fall color and relaxing summer shade. The branches are adorned with beautiful, bold bunches of small red flowers in the mid-spring before its leaves come in. By mid-summer, the flowers are replaced by the bright red fruit that stands out against the shiny green leaves. The best treat it produces in the fall isn’t candy but, it’s just as sweet to the eyes with leaves brightly colored in shades of orange to red. Red Sunset Maple can grow well in full and partial sunlight and will also do great in fertile and well-drained moist soil conditions. It will also provide a spectacular array of color during the autumn months. The stunning look of the tree doesn’t end during winter time; Once the foliage has fallen, left exposed are its reddish limbs. These are great to provide lots of shade on those hot and humid summer days and evenings. They look amazing as they grow and become healthy and also works great to bring in lots of much-needed curb appeal for lawns. These trees are beautiful and definitely can become the focal point on a garden as they display their vibrant colors and beauty. Red Sunset Maple work great with large or small yards and also with all types of landscaping projects. It will bloom during the colder months. This tree will enjoy soils that are fertile and moist but well-drained in its content. In the fall, the foliage will turn beautiful colors of orange and red, really making it stand out in your landscape. 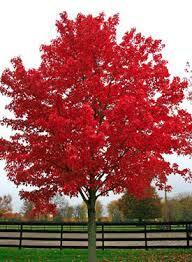 Everyone wants a red sunset maple when they see on in the fall of the year. Its vibrant hues of burgundy and reds are the most colorful of all the Autumn colors of trees making it a #1 seller at our plant nursery. These trees are trendy because of the colors they provide and also as they are very sturdy and hardy. These trees can go through all weather conditions and even sustain high winds and snowstorms very well. When homeowners are considering trees to add a unique look to their lawns, these are the perfect choice when it comes to trees. They add a significant amount of curb appeal and also value to a home. They are very easy to grow and care for and are great for busy homeowners and gardeners. These trees, when grown, wakes up all lawns with the colors they provide, and they work great for all types of landscaping projects.